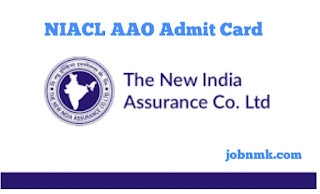 NIACL AAO Admit Card. New India Assurance Company Limited (NIACL) has on 9th February Issued the Mains Exam Admit Card for the Post of Assistant Administrative Officer (SAO) Recruitment 2018. The Candidates Who had applied for this exam Can now download their Admit card by just reading the details given below. Step 1- Click on the official link given as we below. Step 2- Enter your Registeration ID and Password or D.O.B. Step 4- Download your admit card.